These are the Moons only insomniacs and night shift workers get to see. These are the waning Moons of morning. For eight mornings I’ve been up at 4 a.m. each day to catch the early Moon and collect a series of images of its waning phases. The result is above, a series that runs from right to left in time, from the 19-day-old waning gibbous Moon, to the 26-day-old thin crescent Moon. I ordered them that way in the composite to reflect the direction the Moon moves across the sky. As it orbits Earth and wanes, the Moon moves from west to east, or right to left, in the sky from morning to morning, at least in the northern hemisphere. A run of clear nights and mornings made the series possible. From Alberta, as dry as it is, too many cloudy nights make a consistent Moon phase series a challenge at best. As it was I had to contend with smoke from forest fires in B.C. which reddened the Moon on the last few mornings, a tint I had to correct for the composite above. But here below, is what the Moon really looked like one morning. 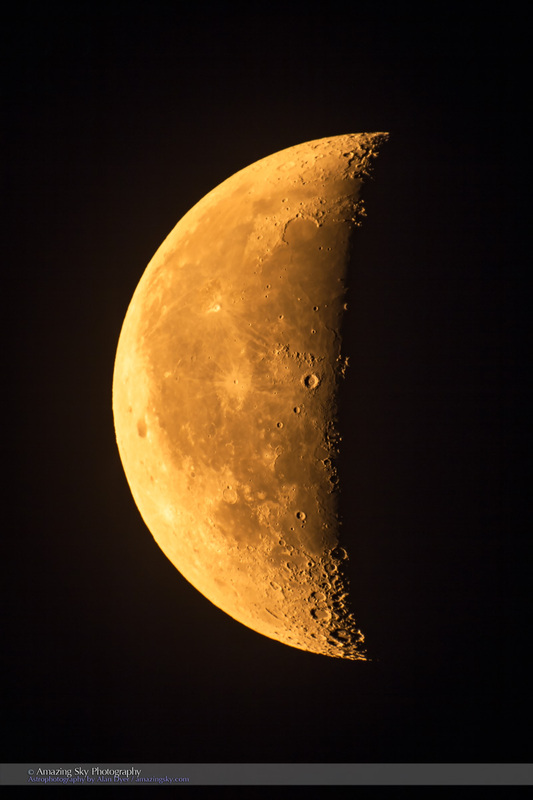 The smoky orange Moon of July 17. The last two Moons, at 25 and 26 days old (i.e. the number of days since the previous New Moon phase) exhibited the phenomenon known as Earthshine. You can see the night side of the Moon glowing gently with sunlight reflected first off the Earth. 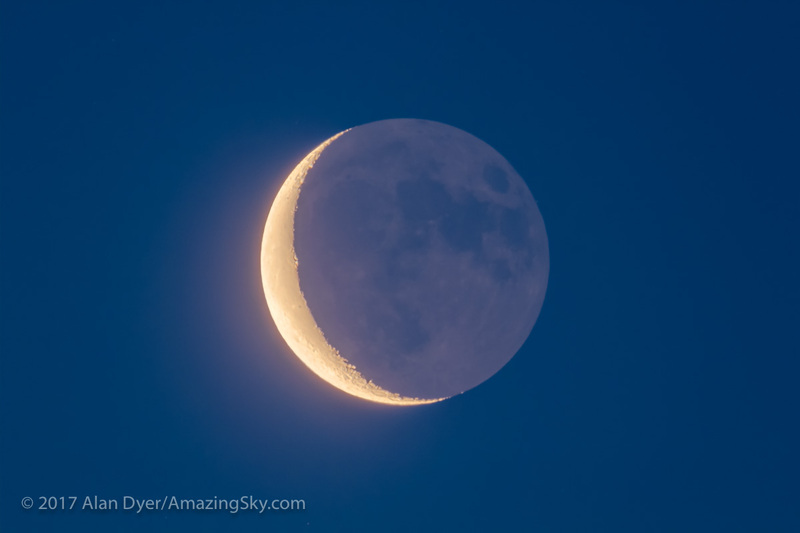 Earthshine on the 25-day old Moon on July 20 at dawn. Below, this was the Moon this morning, July 21, with it very low in the east amid the twilight sky. 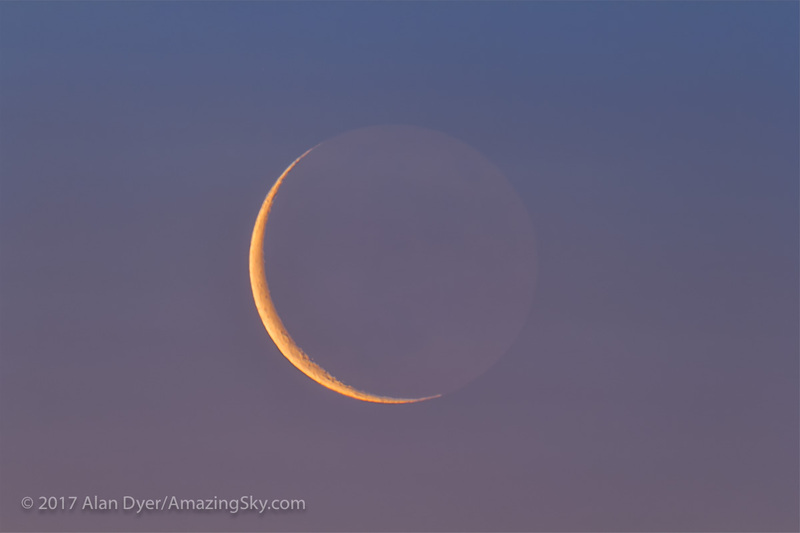 Earthshine on the thin 26-day old Moon on July 21 at dawn. 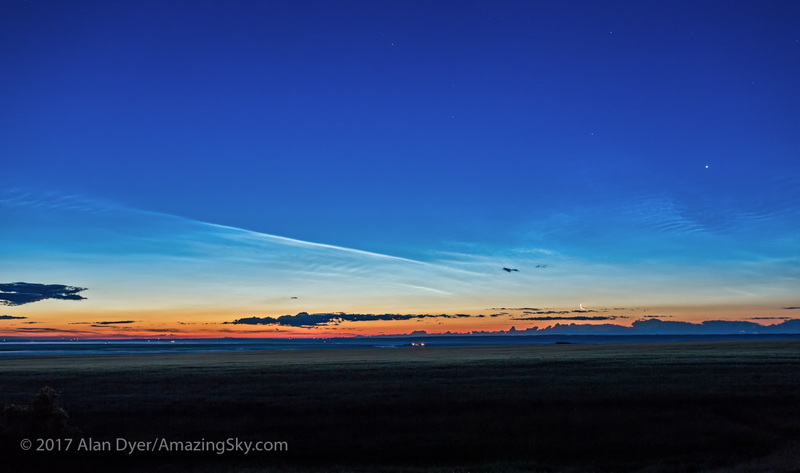 Noctilucent clouds with the Moon and Venus in the dawn sky, from southern Alberta, July 21, 2017. 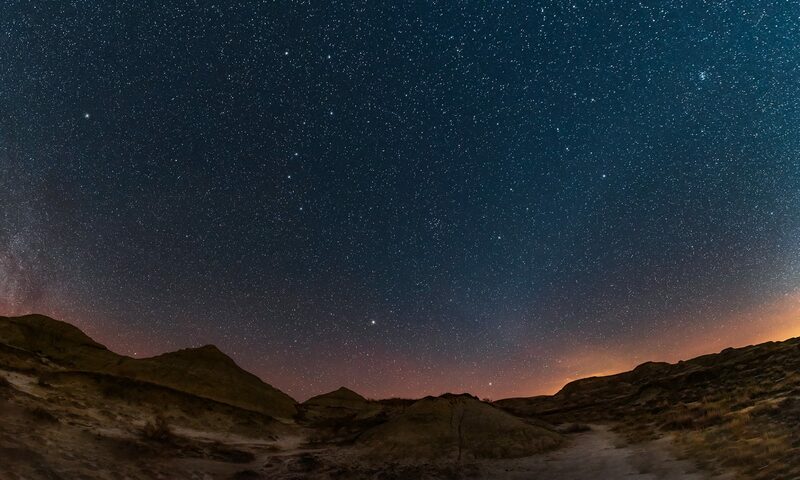 The thin crescent Moon is just rising at right, with Venus bright as a “morning star” at far right. This was a sky certainly worth losing sleep over. Are you practicing for the 21st? I know I am! You bet! Next week will be great for practicing wide angle time lapses with the waxing moon standing in for the eclipsed Sun.